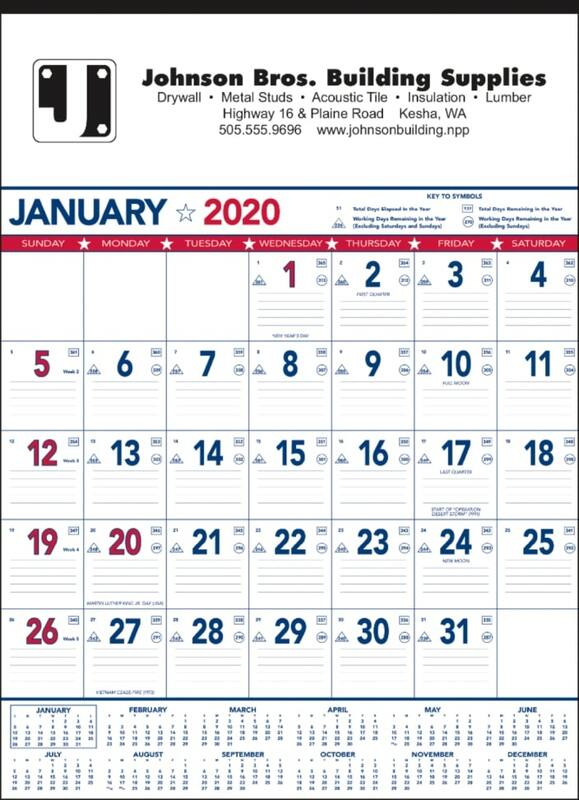 Wall calendars can definitely show your patriotism when custom printed for a corporate calendar. Promotional applications include red, white & blue colors for USA Made products and services. Features include quality 50 lb. offset paper stock, thick tinned at top & backside hanger loop. in the year, working days excluding Sundays, total days elapsed, total days remaining. Year at a Glance 12 month calendar at bottom, 13 sheets with Dec. of previous year. Delivery from date of order is usually 2 weeks thru Dec. 1 each year. Our company manufactures rebar and steel joists. Being sales manager I decided that a large calendar, patriotic theme, USA made with all the features in the calendar blocks was going to be just right for us. Gets peoples attention, they see our logo and what we do everyday, many times a day. Also with multiple locations our phone numbers are readily at hand of prospects and current customers. The print looks great, the overall quality of the calendar better than expected too. Satisfied and then some.